If you follow news, particularly about health and well being, you might have heard about gluten free diets. Gluten free is the latest buzz word in the nutrition industry. Pro-gluten free camp will give you a lot of reason to for it. On the other hand, some researches and reports warn against this diet. It is important to know about it before jumping on the bandwagon. It is never a good idea to blindly adopt a diet, even if the whole world is doing it. Gluten has been derived from the Latin word gluten, which means glue. It is a generic name for diffreent types of proteins found in wheat (emmer, einkron, durum, wheatberries, farro, graham, semolina, and spelt), rye, barley, and triticale (something like wheat and rye). Gluten is like a glue which holds food together and help it maintain its shape. Gluten gives elasticity to dough, helps it rise, and gives the end product a chewy texture. Most people go gluten free when they do not even know what gluten is! Wheat is a component of bread, baked items, pasta, soup, cereal, sauce, salad dressing, and roux. Barley is found in malt, food coloring, beer, soups, and some yeasts. Rye is found in cereals, rye beer, and rye breads. It is a new grain, and has wheat and barley like qualities. It can be found in breads, cereals, and pastas. Many other items also contain gluten, they are often camouflaged. Gluten does not only give elasticity and shape to food, it also has many other health benefits. It is used to make seitan, a meat alternative prepared for vegetarians. It is used to make faux beef, faux chicken, and other non vegetarian food. Gluten is also added to food to increase protein content. Gluten is very high in protein. A 4 ounce portion of seitan has 50% of recommended daily protein. This means around 26 grams of protein. It is also low in fat. Wheat gluten flour has a lot of protein. Protein intake is vital for a healthy body. Lack of protein can also give you hair, ,nail, and skin problems. Gluten is also high in iron. The amount of iron intake will depend on what you are having. A quarter cup of flour will fulfill 9% of your daily iron requirement. Seitan has a lot more iron, comparatively. An ounce serving of seitan will fulfill 20% of your daily requirement. Gluten also gives you plenty of other nutrients. It does not add cholestrol to your diet, which is an added plus. It is also almost sodium free. Gluten also provides a small amount of calcium. So, basically, gluten is a powerhouse of important, healthy nutrients which are required by the body. 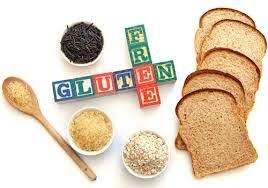 Foods that usually contain gluten, like wheat and barley, are important components of a diet. They help lower the risk of different diseases like heart diseases and diabetes. In fact, it has been recommended that half of the carbohydrates in a person’s diet should come from whole grains. In recent years, gluten has been promoted as something you should stay away from. This is what gave rise to the gluten free diet. A lot of health bloggers, celebrity chefs, celebrities, and nutritionists have wrote extensively about the dangers of having gluten in your diet. The problem with this type of demonization of foods is that it fails to acknowledge the fact that everyone has different bodies. Some people might show an adverse reaction to peanut, for instance, and others can eat jars of peanut bitter without showing the tiniest discomfort. It is a genetic autoimmune disorder where the intake of gluten can cause damage in the small intestine. It affects around 1 in 100 people all over the world. A lot of people remain diagnosed, and they are at a risk for health complications. When people with celiac disease eat gluten, the body responses by attacking the small intestine. Tis attack can damage villi, projections in small intestine that are responsible for nutrient absorption. If the villi is damaged, body cannot absorb nutrients from food. The only treatment for celiac disease is a gluten free diet. Most patients report quick healing when they give up on gluten, although intestinal healing may take some years. Celiac disease is hereditary, which means it runs in the family. People with first degree relationship with someone who suffers from celiac disease (parent, sibling, child) have 10% chances of developing it. Celiac disease can have long term health affects if it remain undetected. It can cause iron deficiency, leading to anemia. It can also cause early onset of osteoporosis. It may also lead to lactose intolerance and gall bladder malfunction. It can also lead to nervous system disorders like ataxia, dementia, seizures, and neuropathy. Self asses yourself for symptoms here or go to your doctor if you fear you may have the celaic disease. A simple blood test is what you need to get done to find out if you suffer from this disease. Awareness about the celiac disease is aroused interest in the gluten free diet. It is connected to the rise of paleo diet, which advocates eating like we did in the stone ages. It is about going back to how people used to eat in ancient time. A lot of people have gone gluten free not because they have the celiac disease, but because they feel good about it. Others have noticed improvements in their own symptoms with the gluten free diet. Antioxidants inhibit oxidation. They delay cell damage. They have alot of benefits, and can be used to prevent diseases. Antioxidants protect your body fro free radicals, which are harmful molecules. They also have a lot of anti-aging and beauty benefits. Anti oxidants are found in fruits in vegetables. If your diet has a lot of processed foods, chances are you are not having enough fruits and vegetables. Even if you are having cooked vegetables, there vitamins count will be low than their uncooked, raw counterparts. This is because cooking for a long time deplete the nutrients in vegetables. That is why it is always advised to either eat your veggies raw, or steam them lightly. If you go gluten free, you wont get the full feeling you get with grains. You will then reach for snacks like fruits and vegetables. This will keep your body well supplied with antioxidants and vegetables. Seems like half of the world is trying to lose the weight. Sorry, my bad, seems like 90% people in the world are trying to lose weight. With conventional foods like pizza, pasta, roti, naan, oatmeal, breads etc, it becomes difficult to lose weight. If you go gluten free, however, you will be cutting these out of your diet. This will also automatically lead to lower consumption of the complimentary food items like cheese, meats, spreads, jams etc. This way you will be cutting out fatty starch from your diet. You will replace them with other option that will not lead to weight gain. If you have digestive issues like upset stomach, gas, bloating, cramping etc, a gluten free diet will make it easier for you to digest food. A gluten free diet will help your body absorb nutrient better. Also, the alternative foods like fresh vegetables and fruits that you will be having instead will pump up your body’s energy levels. Planning to go on a gluten free diet because you fear you have the celiac disease, or for some other health reasons? Here are some tips to help you get by! Packaged foods in UK and USA are required by law to mention allergens, even if a little bit has been used. Most of the times these ingredients are highlighted in bold. The allergen labeling will help you know whether or not that food item is gluten fee. So, when you are out shopping, make sure you check food labels. Should you give up on pastas and breads just because you have gone gluten free? No way! Choose gluten free alternatives. These can be found in supermarkets or health food stores. Some foods are naturally gluten free. List includes fruits, vegetables, meat, poultry, fish, cheese, and eggs. Not all grains contain gluten. You can still have amaranth, brown rice, wild rice, white rice, millet, pea flour, potato flour, quinoa, cornstarch, corn, coconut flour, buckwheat, almond meal flour, soy flour and teff. Going gluten free doesnt mean you have to sulk at home while your family is dining out. 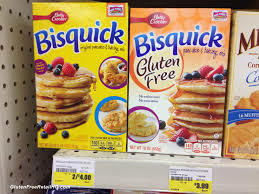 Search for places that offer gluten free foods. Do not restrict your social activities because of this diet. A lot of sauces, gravies, and stocks also contain gluten. Do read labels before helping yourself with a serving. Make your own sauces. Recipes can easily be found online. Use alternatives like cornstarch to thicken them up. Experiment with recipes. Come up with your own master pieces. This will make eating fun and you wont feel that your diet is restrictive. New to this diet? These recipes will help you get by! 2. 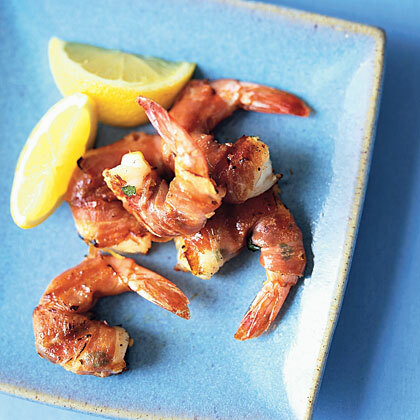 In a bowl, mix the shrimp, basil, olive oil, lemon zest, salt, red pepper , and black pepper. Mix well and set aside. 3. Lay the prosciutto slices on a surface, and cut in half lengthwise so you have 20 pieces. Wrap it around each shrimp, and put on an skewer. Repeat with remaining shrimps. 4. Place the skewers on a broiling pan with a light coating of oil. Broil the shrimp 2 minutes on each side. To prepare chips, arrange tortillas in a single layer on baking sheet. Coat wedges lightly with cooking spray; sprinkle sparsely with salt. Bake at 375° for 15 minutes or until done. Bring down oven temperature to 350°. 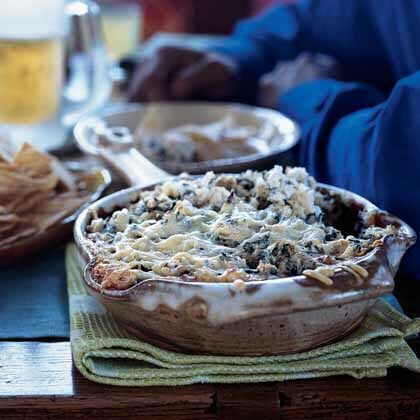 To prepare dip, mix mozzarella, quarter cup Asiago, sour cream, and remaining ingredients, stirring until blended. Put spinach mixture into a 1 1/2-quart baking dish coated with cooking spray. Sprinkle with remaining Asiago. Bake at 350° for 40 minutes or done. Serve warm. Coat the salmon fillet with spices and oil. Set aside for marination. In a small saucepan with a lid simmer the rice over medium heat for 25 mins. After 15 mins, season the salmon, then place the fish in a non-stick frying pan. Place over a medium-high heat and cook the for 5 mins, then turn it over and cook on the other side for 1-2 mins more. Drain the rice, then put it in the saucepan and toss beetroot, spring onion, lemon juice and seasoning. Cut bitter gourd in thin slices with seeds. Rub with salt, turmeric, and red chili. Fry onions in a pan till they are golden brown and crispy. Deep fry the marinated bitter gourd. Now add this to bitter gourd. Sprinkle with coriander and chat masala and serve. Gluten free diet was originally introduced for people in need for it i.e. those suffering from celiac disease. As awareness regarding celiac disease increase, more people adopted this diet. Nutritionists say that a gluten free diet can be unhealthy. Someone who isn’t suffering from the cliac disease does not actually need a gluten free diet. In fact this diet can cost them! Whole grains are a good source of fiber, vitamins, and minerals. Gluten free products are low in nutrients. If you adopt this diet, you will be depriving your body of a lot of vital nutrients. This diet can be free in fiber, iron, folate, niacin, thiamine, calcium, vitamin, phosphorus, b12, and zinc. All of these nutrients are needed by the body. A lot of people receive instant gratification from a gluten free diet because they load up on fruits and veggies. Fruits and vegetables are bound to make you feel better. You cannot attribute the feel good factor to eliminating gluten from diet. You should only go for this diet if you have celiac disease or if you are allergic to wheat or any other gluten food. Going for this diet just because it sounds cool is a very ignorant decision. In fact, a recent research has found that gluten free diet may in fact increase your chances of developing type two diabetes. People who eat eat gluten are 13 percent less likely to develop diabetes. 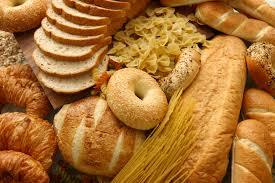 People who eat gluten eat more fibre, which helps to lower diabetes risk. This fad diet has also helped to create a new industry that creates gluten free products. This has also caused the price of gluten free diet to go up, making it difficult for people who genuinely cannot have food with gluten. What are your thoughts on this diet? Is it a fad or good? Have you tried it? Let us know below! Next article10 reasons why guys are pro at life!